Posted November 7, 2014 by Sami Kelsh & filed under Episodes. Well, we probably could have seen it coming that it wasn’t going to end well. Our heroes meet at last, and oh irony of ironies, they find themselves duking it out, each delivering a fatal blow to the other just as the war’s end is announced. It doesn’t get much more senseless a death than that. And then there are the ones who did make it: it is clear that young Derek (beautifully played by Brian Fletcher) is not going to emerge unscathed. He is a reminder of what survivors had to cope with before we knew that PTSD was a thing. As for the families of our heroes, we see Michael’s wife and parents happily enjoying a meal (of what little they managed to scrape together, given the fights over a loaf of bread we witnessed earlier in the episode) and Joanna looking forward to Thomas meeting his infant son for the first time. Way to twist that knife of nothing-is-ever-going-to-be-okay-again even deeper, guys. So much warmth and sentiment just makes the inevitable grim and violence even more depressing. 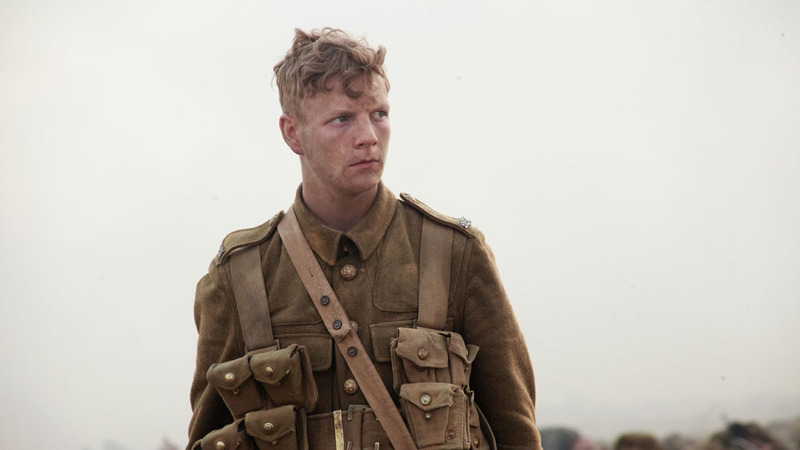 I’m not sure if the closing shots of the fallen soldiers, British and German, walking off arm-in-arm into the sunset wasn’t bordering on a little schmaltz – I mean, you’re either going to be deeply moved, or roll your eyes. Tony Jordan’s writing throughout has been bittersweet, and sprinkles in just a little more sweetness at the end. It all serves to drive home the fact that both sides lost good people, young men like Michael and Thomas with dreams and families, and not just a mass of faceless bodies somewhere under a field of unmarked graves. We see this in the way our story ends, a desperate and exhausted fight between two desperate and exhausted men who under any other circumstances may well have been friends, while unbeknownst to them, the fate of everyone they know and love is determined by a blur of politicians signing pieces of paper. I can see why they felt the need for a bit of schmaltz, because that’s enough to send anyone into an existential crisis if you’re not careful. Aired at 7pm on Friday 7 November 2014 on BBC One. > Like The Passing Bells on Facebook. > Order The Passing Bells on DVD on Amazon. I really enjoyed it as well. Very moving. A brilliant production. A completely new angle. Superb acting. Obvious research into events, uniforms and weapons. etc. Very loyal to the theme of the Wilfred Owen poem ‘Anthem for Doomed Youth’ and its memorable first line “What passing-bells for these who die as cattle?” Owen himself was just 25 when killed in action on 4 Nov 1918. If you read his poetry and understand the man, you will understand the story of Tommy and Michael.